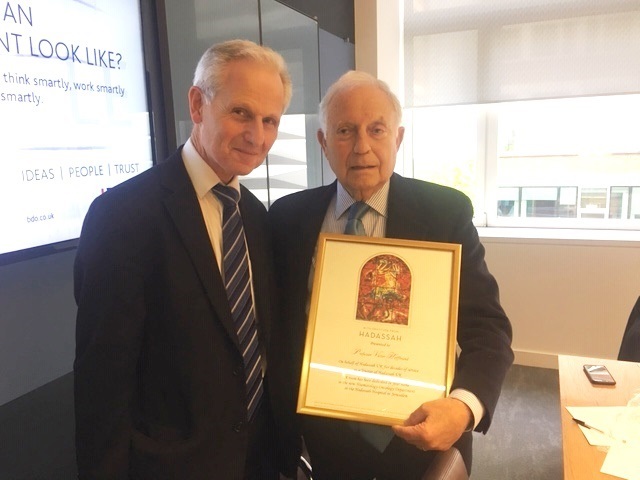 Allan Victor Hoffbrand, Emeritus Professor of Hematology at University College in London, was recently honored in recognition of the 23 years he has served on the Hadassah UK Board of Trustees, and the over 50 years he has been associated with the Hadassah Hospital. A room has been dedicated in his name in the Hematology Oncology Department in the Round Building at Hadassah Ein Kerem. In a special ceremony marking his retirement from the Hadassah UK Board of Trustees, David Waterman, Chair of Hadassah UK, talked about Prof. Hoffbrand’s many achievements for Hadassah, presented him with a beautiful certificate in recognition of his dedication, and read a letter of appreciation from Hadassah International. 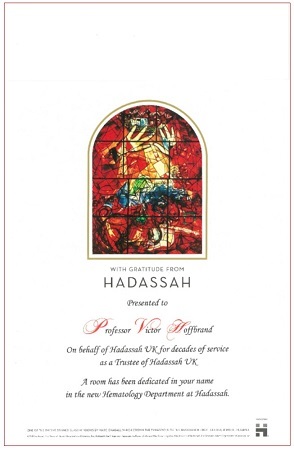 Prof. Hoffbrand was deeply touched by this special acknowledgement of all that he has done for Hadassah. Prof. Hoffbrand is internationally renowned for his research and is the author of several internationally accepted textbooks on hematology. He recently received the Wallace H. Coulter Lifetime Achievement Award 2018 from the American Association of Hematology. Prof. Hoffbrand is not breaking his ties with Hadassah. He will now serve on the Hadassah UK Advisory Committee.